Right now, today, there are people marching all over the world. Marching to change our food system. As I drove to the farmers’ market this morning, I was a little remiss about not being able to attend the march in downtown Los Angeles, but then got realistic about taking both my little ones on the train ride down there, walking many more blocks than my 5-year-old could endure, and then coming home, possibly having to walk back to where we started to pick up the train again, all on my own. These could be seen as excuses, I guess, but in the this long haul of healing our food system, self-preservation is important. (If you are wondering why people care so much about opposing Monsanto and GMOs, check out this post by Stacey at Slow Foods Mama. She gives a very good and thorough overview of GMOs and the big business behind them). Marches are important, so important. They grab media attention, inspire people, create momentum, and hopefully make enough noise to get some people, who may have not been listening before, to notice. Thinking about the march this morning I was taken back to another march I participated in that did all these things. Being a part of the 1999 WTO protest in Seattle, Washington was one of those moments that was transformative for me, and for so many others. My friends and I woke up before dawn the morning of the first day of the WTO conference and marched downtown from Capitol Hill. I will never forget the feeling of hope and empowerment that filled me when we turned the corner onto 4th street and gazed down over a sea of people. The day was very young and there were already thousands upon thousands of people in the streets with every intersection locked down. What transpired that day, the creativity and organization of the day’s actions, the brutality of the Seattle police force, the enduring perseverance of the activists showed me the scope of what is possible for change (both good and bad). I first learned about GMOs and Monsanto in the months and days leading up to the WTO protests. At the time, I lived in Olympia, just an hour’s drive from Seattle. The lead up to November 30 was a buzz of teach-ins, organizing for the marches and direct action, street theater performances, trainings, etc. 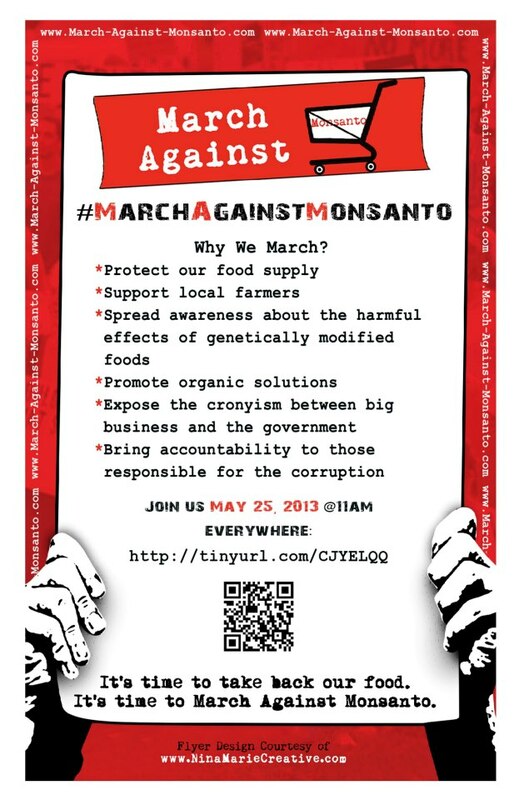 So, today, there is a march to protest Monsanto, just one of the many facets of what people were standing up against in Seattle all those years ago. Not much has changed for Monsanto in the United States since then. They are just as powerful as ever, but the tide may finally be changing. After the Seattle WTO protests were over I remember a lot of conversations revolving around the question, “What now?” And often the answer was to keep doing the work, the quieter work: talking to people, challenging these companies and policies in other ways, getting involved in organizations who work for change every day, and even challenging the way those organizations work. So, whether or not you marched today, keep on keepin’ on and make sure you are not supporting Monsanto with your dollars. Buy from safe seed companies. Use this list to avoid buying Monsanto owned vegetable varieties at your local nursery. Keep apprised of Monsanto’s dealings with your government. For U.S. residents see this article and this one. And then get involved with and support the alternative food system that is emerging all over the country and gaining more traction, creativity, and reach every day. And when the next march comes around, make every effort to get there.